Hi everyone! I’m delighted to be here—what a cool place! Pull up a comfortable armchair here in the gondola of our airship, have a cup of tea (or a thimble of something stronger), and join me for a cozy chat among friends while we sail among the clouds! In the fall of 2011 I made the decision to leave the day job and write full time, and have never looked back. Since 2002 I’d been working full time in marketing in Silicon Valley, while writing three books a year for publishers such as Harlequin, Warner, and Hachette. Needless to say, something had to give! The first book in my Magnificent Devices steampunk series, called Lady of Devices, had been turned down by ten publishers, so in a life-changing moment, I decided to take my friend Bella Andre’s advice and self publish it. Before I knew it, I was getting reader letters saying how much people loved my spunky heroine, Lady Claire Trevelyan. Book two in the series hit #14 on the historical fantasy bestseller list. Book one hit #1 on the free list (it’s still free until January 30!) Two universities have added the series to their reading lists for their literature classes, and book clubs are reading the series now, too. Who’d have believed it? I’m so grateful to readers who love a little adventure in their reading—steampunk with spirit, if you will. For me, it’s the endless possibility of the worlds you can create in this subgenre. If you can imagine it, you can write it—and readers will go with you if they trust you to give them a good read. I just love the “maker” philosophy and the sense of wonder that the Victorians had about technology. For them, technology was about making life better, and they seemed to have no boundaries in their imagination of gadgets and gizmos to accomplish all kinds of things to that end. Whether they actually worked in the physical world or not, the point was that someone could think of it, and the only limit was their imagination. Writing a book is a little like that! I simply can’t manage without my temporal decay monitor. Or one of my many hats. 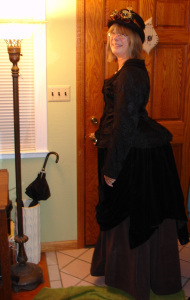 Not to mention a bustle pad with a concealed pocket. A lady can never have too many pockets. Back in the sixties my favorite show was The Wild Wild West. Every week, Artemus Gordon invented a cool new device, and of course, the train was packed full of them. Instead of playing house, we neighborhood kids would re-enact the episodes from the week, and since I was the oldest, I got to be James West. But I secretly wanted to be Artemus. In my book, brains outshone brawn any day. That outlook still pervades my Magnificent Devices series, where a lady of intellect can make a success of herself no matter what her economic status. Brilliant Devices, the fourth book in the series, will be released at the end of February. It will wrap up the adventures of Lady Claire, who will go on to do great things offstage during the next three standalones in the series. I’m planning seven in all. I just adore the Mopsies—ten-year-old twin girls who have been living on the streets since they were very small. Maggie and Lizzie are smart, quick on the uptake, slightly cynical about human nature … and can fleece a toff in less time than it takes to smile at him. The Mopsies are the scouts and watchers of the gang of children that Lady Claire takes under her wing. And in watching her, they learn what it means to really be a lady—to trust in their own resources and make their own luck, while at the same time putting others first and helping those who are less fortunate. This ragtag group becomes a family over the course of the books … and it’s the Mopsies who feel that connection most deeply. In any genre, one of the things an author fears is being derivative—consciously or unconsciously repeating what has gone before. I’ve read widely in this genre so make a focused effort not to repeat what others have done while still enjoying the tropes that we readers love: airships, ray guns, goggles … and the subversive nature of it. I have the greatest fun imagining how something that we use now—say, a car—would function in a steampunk universe. In the Magnificent Devices universe, the combustion engine has been a failure, and in fact was the incident that changed Lady Claire’s life. So if cars run on steam, what do they look like? How are they steered? Do you have to throw wood under the hood to heat a boiler to create steam, or can you use another method? A person could spend a lot of time researching these things instead of writing, so it’s a fine line to walk. It’s a fun one, though! What I like best about it is that the morals and conventions of Victorian society provide a backdrop for the outlandish devices and the strong personalities that we enjoy in the genre. The tension between “stiff and strait-laced” and “wildly imaginative” gives you a play zone that is really interesting to me. And it’s how I can have a well-brought-up young lady learning to shoot a ray gun in one scene and teaching the Mopsies the proper way to pour tea in another. All my books, no matter how imaginative, are underpinned by research. I went to London a couple of months ago and photographed locations in the books, such as Bedlam, Belgravia, and the Thames at low tide, so that I can use the details and the physical experience in the books. Google Earth can take you a long way, but there’s nothing like actually going to the Imperial War Museum, which was originally the Bedlam insane asylum, and walking that circular drive, seeing the wall at the back over which my characters escaped, and feeling the atmosphere of the place. For the Lady Lucy, an airship that figures prominently in the stories, I referred to a huge old book on Zeppelin airships with floor plans and cabin layouts. I spoke with an expert on steam engines to make sure that my trains operated properly. Yes, the “science” behind the Selwyn Kinetick Carbonator, a device in the books, is made up, but the steam that runs it is not. Writing steampunk is a fascinating balance between the world of reality and the world of imagination. I think that’s why I love it so much! And now our ship is being secured to its mooring mast and I can hear the crew lowering the gangway. 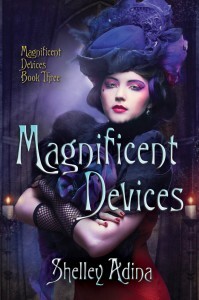 Last thing—I’m giving away the first three books in the Magnificent Devices series in whichever format you prefer to read. Just leave a comment to be entered! PRIZE UPDATE: Congratulations to Martha! It’s been such a pleasure sailing with you—do come and visit me at www.shelleyadina.com! I enjoyed your first book very much. Looking forward to reading the rest of the series. I love this series! I have to to say it’s so intriguing with so many wonderful and unique elements. Thank you for sharing such a wonderful world with us! I love these books, they are among my favorite steampunk reads. Keep writing them. Love your books, Shelley! Can’t wait for the next release! Thanks for sharing your process of writing steampunk. Shelley, it’s so much fun to hear about your writing process. Thanks for sharing! Have never read this type of story, sounds fiscinating, would love to have them! 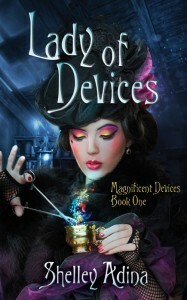 I love your Magnificent Devices books and can’t wait to read the 4th one. I loved The Wild, Wild West, too. What a creative show. Love your covers. It sounds like a fabulous series. What a great post, Shelley. I love this series. It was my first introduction to Steampunk, which has now become one of my favorite genres. I’ll have to go check out your short story about the Mopsies. They’re great characters. Love your robust story-world: the wit, the romance. Love that you took the self-publishing plunge, else we would be high and dry–steamless, in a word–without Lady Claire! Shelley, I sent print versions of your first two books to my brother and his two daughters for Christmas. Upon the clerk’s advice, I ended up repacking them in a cheaper flat-rate box. She noticed the gorgeous covers and wanted to talk about them, so I got to tell her how wonderful the books are! Your steampunk is great! I was a fan of your writing LONG AGO and knew you’d shoot to the top in that airship!! CONGRATS on such a wonderful series. I LOVE IT!! Looking forward to the Mopsies’ book and to the next adventure of Claire. So happy for your success, Shelley. You’ve created a fantastic series for steampunk fans. Love your world-building! Shelley… congratulations on you success and having the courage and faith for going it alone. The reading world s a richer place because of your decision. I am looking forward to reading your series. Sounds fabulous! Thanks, Annie! It was a scary decision, but it turned out to be an amazing adventure and put the joy back into writing. Now I play in both fields! So glad I got this blog and found you. I cant wait to read more! I have been enthusiastic about Steampunk for sometime now – and have even started being crafty with jewelry in a steampunk mode. I too loved Artie and WWW on TV… watch reruns even now! I have been reading on my Kindle, but since I am still very much a book lover, enjoying the sensile part of reading “real” books, I would love to have a set of the first three books. Thanks for the opportunity! The industry needs originality to break away from the “cookie cutter” novels that have dominated the scene for the past 60 years. It appears you have achieved that here with your series. I dream of the day that my husband has received enough annual pay raises for me to be able to only take a select amount of cases and spend more time on my other passion, crafting. The Mopsies are my favorite characters too, because I am a child dependency and neglect attorney and they remind me so much of my kids I represent every day! Wise beyond their years for the life they’ve lived and resourceful beyond belief. I really enjoy your books. The Steampunk Lady at the top looks like your character. Intriguing info, thanks for sharing! I just finished Lady of Devices, the very first steampunk novel I’ve ever read. The concept of the genre had intimidated me a little and I thought it would be all about gimicky tech stuff. Instead, I found a lovely character-driven story. Thanks for the great read, Shelley. I look forward to reading the rest of Lady Claire’s books. Steampunk is not something I am very familiar with. I have read one book that was considered steampunk but never knew that was what it was considered lol. Your books sound intriguing and fascinating. I definitely think your stories are something I would enjoy reading. I hope you continue to have success doing what you love to do. Good interview! You are a new author to me so I’ll start looking for your books. The descriptions sound intriguing. Thank you for your information. You have me hooked. I want to dive it and read right now. Wishing you much success – you deserve it. Great interview! I’m intrigued & want to read your first book Kobo style! 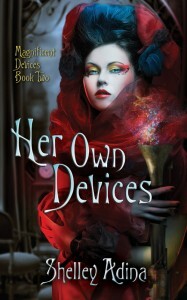 Lady of Devices was my first introduction to Steampunk (although I used to watch Wild, Wild West, too), and just fell in love with Lady Claire and the entire world you’ve built. So glad to hear there’s more books coming! I read your book shortly after taking an on-line course on Steam-punk and was blown away. With wonderful characters you showed me what steam-punk could be. What a great interview Shelley — on the ground research sounds like a very good idea and I agree that it gives an athenticity that’s hard to get with only Internet travel. And I love the names of your characters – would enjoy hearing more about your inspiration for finding names that work and are memorable. I just love this series. Congratulations, enjoyed the interview very much. Glad I’m retired, no guilt about the nose in the book and who cares when the supper is ready (lol). Look foreward to the rest of the series as I do appreciate your authenticity and imagination. Good on ya. I’m one of your favorite fans! That sounds like fun research. Well – this is a new genre to me – I had to come and try to figure out what on earth was involved in Steampunk! Sounds like fun and very intriguing, the way you describe it. I’m sure you’ll do well with your writing – and having fun while writing, even with all the research, seems like an ideal writer’s life! Cheers. Just starting to get into steampunk… These books sound wonderful!! I’ve just downloaded your first book to check it out. Thanks so much for the giveaway opportunity! This series sounds wonderful! There’s no limit to where you can go in this steampunk world and I look forward to the ride! Thanks! PS It was a great interview and an inspirational publication story! Glad to know steampunk is still doing well as a genre, and that you had the courage to self-pub your series. I downloaded the first one and can’t wait to read it. Great interview! Love the Mopsies! What a wonderful site and a great interview. My daughters devour steampunk. I’ll send them to this site to read your post. The books sound like something they would love to read. Wonderful books with wonerful covers by a wonderful author! Your success with this series is so well deserved, Shelley! I’ve dressed steampunk and now obviously I’m going to have to read steampunk. 😉 You’re books sound awesome! I’m dying to know how you managed a steam-powered car–I’m an American Heavy Metal kinda gal. 😀 Even if I don’t win, I want this series–how do I get them in paperback? And that pic of you all steampunky is fabulous! LOL! I made the skirt and bustle using TrulyVictorian.com patterns, and then topped them with a Victorian blouse I found in a tiny mountain town in Austria. It all works! If you don’t happen to win the drawing, the paperbacks are available on Amazon, or via CreateSpace, the printer. Either way, thank you! Shelley, I love these books and your blogs and you continue to be an inspiration to me as I continue write…I hit the pages every morning and someday, something will arise! Best wishes as you continue the saga and I can’t wait to see what brilliant devices Claire has up her sleeve! See, I could spend ALL my time researching the fun devices and never write a word! I heard yesterday that Steam Punk began with H.G. Wells and Jules Verne. Never thought of that. Thoroughly enjoyed this post. What a terrific world you created. Love your covers Shelley! They’re fabulous. And the books themselves are even better! Congratulations on the upcoming release! 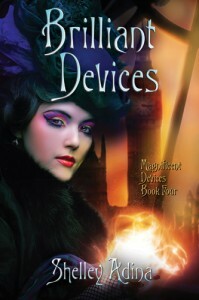 I really enjoyed Lady of Devices and gave it 5 stars. Shelley is such a great writer, I really enjoyed Lady of Devices. It was probably my first steampunk read and she painted a fantastic world. I agree that the hardest part of writing is creating something original, and she did a great job. I really enjoyed the post and I’d like to let you know Shelly, that I adored Lady of Devices and I’m looking forward to reading the rest of the series. Susan, this article is amazing. I’m going to print it out as research for the Mopsies’ book. Thank you!